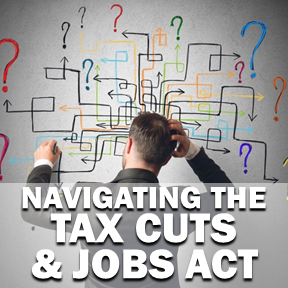 Nearly everything involving taxes in our country has been acutely affected by the Tax Cuts and Jobs Act (TCJA). Unfortunately, owing and paying tax are still necessary and required in most cases, but on the other hand we are treading on new terrain for year-end tax planning. We will explore some actions taxpayers can make before the end of 2018 that can provide a tax benefit. One of the most impactful changes to individual taxpayers is the limitation on state income tax and real estate tax paid (the so-called SaLT deduction) to $10,000. Many taxpayers, especially those in high-tax states, were itemizing their deductions primarily due to their state tax burden. Couple this limit with the drastic increase of the standard deduction ($24k for married filing joint taxpayers), and you will find most taxpayers will no longer itemize their deductions. Bunching deductions. If you have significant deductions that are just below the standard deduction, you might consider “bunching” your deductions, i.e. paying charitable contributions on January 1st and December 31st of year one, and then not making such contributions in year two. As a result, you will itemize deductions in year one and tax the standard deduction in year two, then alternate this method each year. For estimated taxpayers, there is no more pressure to get your 4th quarter estimated state tax payment in on or before December 31st since you will likely already exceed the $10k cap, and therefore receive no benefit from paying the estimate two weeks early (they are due January 15th). To put individual taxpayers on more even ground with corporations that now have a 21% flat tax rate, the TCJA provides a deduction of up to 20% of income from pass-through entities. Depending on the income level of a taxpayer and the type of business that generates the income, this 20% deduction may be limited or altogether eliminated. We will discuss this provision in depth in a different article, but we will explore basic tax planning here. For s-corporation shareholders, consider adjusting owner’s salaries to maximize the deduction. If a taxpayer’s income is over the threshold and the business is qualified, the 20% deduction may be limited to 50% of the wages paid by the company. Since only the pass-through income and not the wages earned from the company get the benefit of a 20% deduction you would prefer the pass-through income to be as high as possible and the wages paid to be as low as possible. There is a sweet spot in the relationship between the wages and the pass-through income that will offer the optimal deduction assuming the owner’s compensation is still considered to be reasonable. An alternate limitation is 25% of wages plus 2.5% of depreciable property. Taxpayers might consider making an investment in tangible property for the business before the end of the year, especially in partnerships or sole proprietorships where owners are precluded from paying themselves wages. There are also enhanced accelerated depreciation incentives in the new tax law that make this an even sweeter deal. An incredible tax deferral tool provided by the TCJA is the advent of qualified opportunity funds (QOFs) which are entities that invest in qualified opportunity zones (QOZs). QOZs are economically depressed areas that have been identified by state governments. The intention of the law is to spur economic investment in these depressed areas. QOFs may present an attractive option for taxpayers that have significantly appreciated property and would like to dispose, but do not want to pay tax on the gain. A taxpayer may defer paying tax on a capital gain, if they invest the gain in a QOF within a 180-day window. If specified holding periods are met, those taxpayers may receive a deemed step up in basis of up to 15%, thereby permanently eliminating tax on that portion of the gain. In addition, the appreciation on the investment in the QOF is not taxed if held 10 years. Only two months remain in 2018, but that is enough time for savvy taxpayers to take advantage of some of the changes to the tax code… and these are just a few of the options available to taxpayers looking to decrease their federal tax liability. As always, consult with your advisor before taking it upon yourself to engage in any of these tactics. Everyone’s personal income tax situation is nuanced, and certain actions may not yield expected results. Today is National One-Hit Wonder Day, and we’re celebrating by kung fu fighting and doing the Safety Dance. But enough tubthumping—we’ve got plenty of tax news to share. Think you know your one-hit wonders? Take the REM Cycle quiz challenge here. We can't think of a clever opening paragraph this week. If you can think of one, leave it in the comments below. Raise a glass! Raich Ende Malter counts several distilleries as clients, so we would be remiss for not mentioning that March 27 of each year is International Whisk(e)y Day. The parenthetical “e” is a tip of the hat to the difference in spelling for Irish and American whiskeys and their Scottish, Canadian, and Japanese (Japanese whisky is apparently a thing) counterparts, which drop the “e.” Not to be confused with World Whisky Day or National Bourbon Day. Remember this at your next pub trivia night. Wake-Up Call - Don't hit the snooze! Welcome back to another edition of The REM Cycle's Wake-Up Call, our biweekly feature where we bring you a variety current tax-related issues. Let's get it started, shall we? That’s all for this week. Got a hot tip? Email us at REMCycle@rem-co.com and tell us all about it. Good morning, and welcome to your first Wake-Up Call of 2018! As you know, we have been publishing every other Tuesday since 2016. This year, the REM Cycle staff has resolved to bring you tax tidbits from a variety of sources on alternate Tuesdays. We promise to keep things fresh and lively to get you going in the morning. That’s it for this week. Did you like your first wake-up call? Leave us a shout-out in the comment section below and let us know what you think. Have a tip for an article you’d like to see linked here? Please forward it to REMCycle@rem-co.com. As you may have read in the news, or heard from your coworker or surly uncle, the wheels of legislation are grinding forward on real and transformative tax reform in our country; it is difficult to avoid talking about it and having an opinion (informed or not). The House put together a bill. The Senate put together a similar bill (which is a sign that they agree on many of the issues at hand). The House revised their bill and now plans to put it to a vote on the floor… this Thursday! All this talk of “winners and losers” and “is this is a middle-class tax cut or not” is dizzying. Eleven months ago, tax reform was destined to be a slam-dunk, with the Republicans controlling the Presidency and majorities in the House and Senate. Fast-forward to November 2017 and things aren’t nearly as certain. The failure to repeal the Affordable Care Act (Obamacare) and a series of gaffes and in-fighting among visible members of the GOP have blown tax reform off course. On the other hand, passing the budget with the allowance for a decrease of $1.5 trillion in revenue over the next ten years was a critical step to the potential realization of tax reform. This was accomplished just recently by a narrow margin. Passing the bill faces many hurdles. One such point of contention is the issue of the State and Local Tax (SaLT) deduction limitations and eliminations that are proposed therein. The SaLT deduction allows taxpayers to reduce federal taxable income by taxes paid to state and local governments. For obvious reasons, this deduction is very popular in high-tax states (such as NY, CA, NJ, etc.). The proposed bills eliminate income tax deductions and either eliminate or limit the real estate tax deduction. This is a sticking point for taxpayers in those states, and therefore their elected officials. Assuming either the limitation on the deduction is increased or some other compromise is reached to satisfy Republican representatives from those states enough to vote in favor and the bill will still operate in the confines of a $1.5 trillion decrease in revenue, this hurdle can be cleared. However, the longevity of tax reform is still at stake. The Senate will most likely try to pass the bill through reconciliation, which is a back-door way to enact legislation. Reconciliation allows a bill to be passed without minority support (the Democrats), provided that the legislation not add to the debt after a period of ten years. This means that some parts of the bill will necessarily have a limited lifespan or tax hikes in the future. The President hopes to have the bill on his desk and ready for his signature in late December, just in time for Christmas. 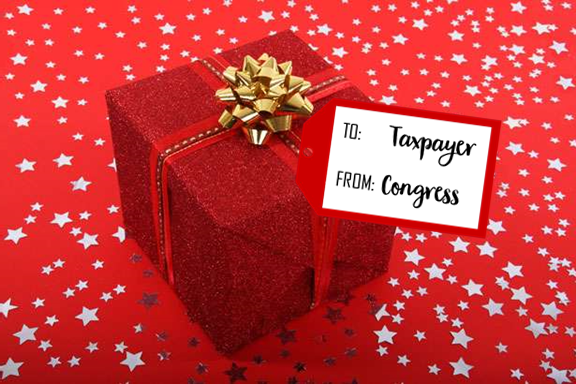 It is a near certainty that any kind of legislation that reaches his desk will be passed for the mere fact that the administration is thirsty for a “win.” Whether tax reform for you is a shiny gift or a lump of coal is still difficult to determine. We will have to see the bill in its final version to be certain.